St Patrick's Community consists of four members. 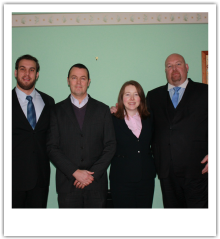 From left to right, Michael Axiak, Niall Slattery, Catherine Leigh, John Pridmore. For more information on each member of our community, click their name above. Interested in joining?, then we would love to hear from you. Please ‘contact us’ to arrange an informal meeting so we can get to know each other.